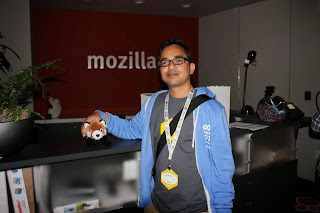 It was an experience while attending and volunteering (Summit Host) at Mozilla Summit 2013. 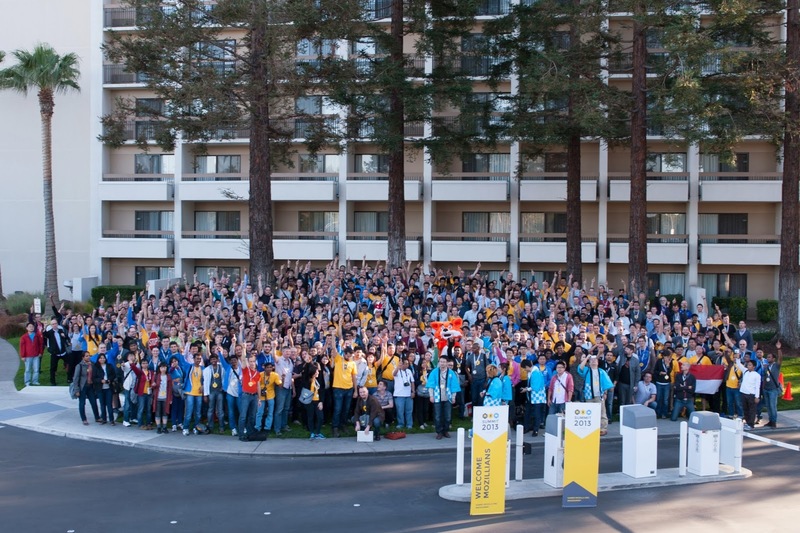 About 700 Mozillians from 95 countries participated in the summit. About fifty Mozillians from India has also participated and gained the opportunity of best learning and networking experience. It was a Three Days Summit hosted at Santa Clara, Brussels and Toronto simultaneously. I attended the Summit at Santa Clara, US. Day 1 of the Summit started with Welcome Note by Tristan Nitot, President of Mozilla Europe. The Keynote talk on “What makes Mozilla 'Mozilla'” was by Mitchell Baker, Chairperson of the Mozilla Foundation. I really loved her idea of “Know More, Do More and Do Better”. Mitchell's talk followed by another talk on Envisioned Future State by Brendan Eich which was a presentation about their long term, project wide, stretch goals. The next was Our World Fair, which was a way for participants to showcase where they come from and/or what they are doing and for others to connect and build bridges to learn more. About 20-30 countries including India participated in World Fair. The other topics of subsequent talks were Building a Web Literate World by Sandraghassen Subbaraya Pillai, Ankit Gadgil, Vineel Reddy Pindi, Benny Chandra, Faye Tandog, Christos Bacharakis, Lawrence Kisuuki, What does "Mozillian" mean by Sujith Reddy, Alex Lakatos, and, Firefox OS in 2014 and beyond By Sandip Kamat, Christian Heilmann. 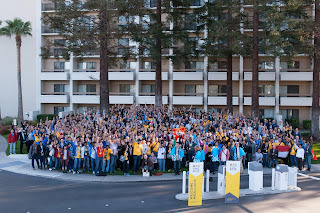 Then we gathered outside the hotel for a group photo, It was really an awesome moment to assemble for the group photo.. The day1 was concluded with the dinner and karaoke. Food throughout the event was just awesome. Day 2 started with welcome note by Tristan Nitot, President of Mozilla Europe. There were various talks followed by the Innovation Fair. The Innovation Fair is a way for participants to showcase what they are working on. 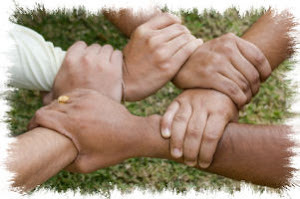 The focus is on products and technology, current or future. Like the World Fair, the Innovation Fair is a way to connect with other Mozillians who may be interested in getting involved with your project. Among the talks that followed thence were One and Done by Parul Mathur, Level Up with Firefox Student Ambassadors! by Vineel Reddy Pindi, and Strategies of industry players and competing effectively by Irina Sandu, Sandip Kamat. Before th end of the day2, some of site hosts got an opportunity to visit the Mozilla Foundation headquarter at Mountain View, I was one of them. It was then time for World Fare Dinner, a sit-down, buffet dinner featuring chef's choice of foods from around the world. Mozilla Summit 2013 Day 3 started with a welcome note. Among the talks that followed were Turning Ideas into Action by Tristan Nitot, President of Mozilla Europe, Designing your project for participation by Benjamin Kerensa, Soumya Deb, Product Opportunities in the Cloud by Toby Elliott, Vishy Krishnamoorthy, Mozilla Reps: How to be more awesome Community Builders by Vineel Reddy Pindi, Galaxy Kadiyala, Amir Aharoni, Culture Pulse: Values Action Plan by Dino Anderson, Plato's Cave: Data At Mozilla by Saptarshi Guha, David Zeber, Economic Justice, Mozilla, and the Trans Pacific Partnership by Eitan Isaacson, Diversity Identity Core Engagement by Dino Anderson, Mozilla IT by Ashish Vijayaram, Security Tools by Patil Kailas Ravsaheb, and Waartaa by Ratnadeep Debnath. Great post! I would really like if you write more content in your article in order to increase audience. Thank you for the share. This would surely be a nice and informative ceremony. I am sure people would have enjoyed the speech too as the speaker of the event looks talented. I managed to attend this thanks to my teacher and it was something I have never ever experienced before. She was really amazing and learned a lot through her sayings.